The Teaching and Learning Collaborative, or TLC, is a network of colleagues on campus who support one another’s efforts to be excellent teachers. On this site you will find a variety of tool kits, strategies, and content curated by the TLC. Visit the TL Community Blog for additional teaching materials from your peers on a wide range of topics including internationalizing curriculum, using peer reviewing class, Teaching Circles, and more. Watch upbeat and My Announcements (in pilots.up.edu) for news of two peer-led teaching workshops each semester. Prior years' topics covered inclusion, gender inquiries, and changing media in the classroom. The TLC will post resources such as short videos and articles weekly in upbeat, which can be viewed in the length of time it takes to enjoy a cup of coffee or Kombucha at your desk. To learn more about the TLC, contact Dr. Karen Eifler, eifler@up.edu. 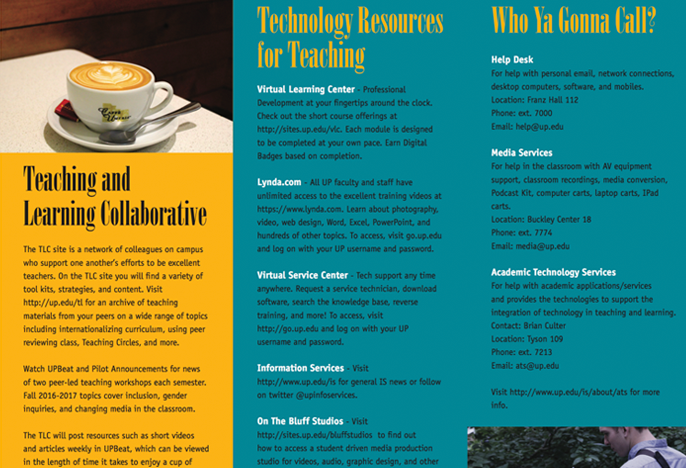 The TLC has developed the following trifold brochure of resources and contact information for faculty. The cover features Dr. Tara Prestholdt, winner of UP's 2018 Teaching Excellence Award.